To begin adding a new property, from the Dashboard, first click Properties (or Sales or Lettings, depending on whether you have both sales and lettings) in the left-hand menu, then click “Create a property” (or “create a Sale” or “Create a Letting” depending on configuration) . 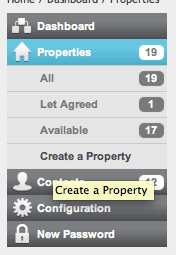 Alternatively, from the property listing screen, click the Plus sign in the top right under your agency name. You are are presented with a new page. Select the branch marketing the property if applicable. Note that the default branch will be the one associated with the currently logged-in user account. Next fill in the house name or number and the post code and click the Complete Address link, or fill in the address manually. If the Complete Address function causes inaccurate data to be filled-in, please edit the entry as required. Note: The ‘Complete Address’ tool is provided for convenience only, may not always be perfectly accurate. The results can be manually overwritten. If you require an address other than the full postal address to be displayed then please complete the Display address box. For example, you may wish not to display the actual house number, or to display just the district and not the actual road name. 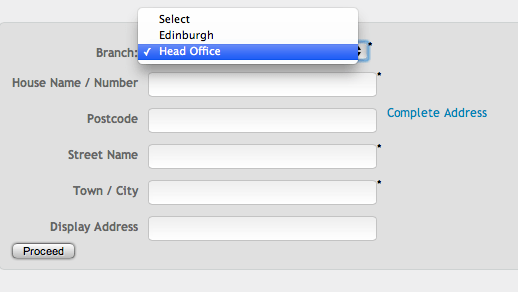 For BDP’s Scottish clients only, if you are a member of ESPC and have ESPC feed selected in the configuration, you will see a box requiring you to fill in the ESPC district.